So since I was feeling overly accomplished and proud of my new piece of jewelry, I ventured to take on a wrapped-wire coin pearl pendant I saw in the latest Art Jewelry magazine. I don’t think it turned out too badly! This one took me about an hour (I was forced to redo the inside section twice -kind of tricky!). I would have had an easier time using Sterling wire (I used silver plated copper) but I never like to use sterling on a project until I work out the kinks in case I have to start over. We recently had the privilege of touring several of our Czech glass supplier’s factories in the Czech Republic, giving us the ability to both take photographs and learn more about how our beads are made. This page specifically highlights the manufacturing techniques for pressed glass beads and firepolished glass beads. Additional links to other czech glass manufacturing are available below. Most Czech Glass made today is manufactured in the the “Liberec” region, primarily in Jablonec, Prosec, Liberec, and several other small surrounding towns and villages. This area of the Czech Republic is located in the far northern reaches of the country, situated less than 30 miles from both Germany & Poland. The photograph below shows the snowcapped mountains that border the countries and that have created a natural border for hundreds of years. The architecture, food, culture, & lifestyle of this region is ‘bohemian’ and will remind many of Bavaria. Glass has been made in these cities for hundreds of years, beginning in the 18th century, and growing and prospering into the 20th century. Around the region, one will see hundreds of little workshops like the one featured below behind homes. Historically, these were used for melting, faceting, and firepolishing the beads. All of this was done in these workshops which featured a hardwood-fired stove for the melting & firepolishing. Even today (and depending upon the size of the order), much of the work done in the Czech Republic is broken up by the factory and given to individuals or families who produce the beads and return the finished products to the factory. For more information on classic firepolishing techniques, see our classic firepolishing page . The second world war sent many German artisans from the area back to Germany, but many artists remained, and continued their trait even through the Cold War. The fall of the wall in Berlin just 20 years ago has caused a great re-vitalization of industry in the region and more widespread acclaim and demand for Czech glass worldwide. There are many different styles of Czech glass beads, but most can be broken down into one of three categories: Pressed Beads, Firepolished Beads, and Table-cut Beads. There are of course also seed beads & machine cut crystal made in the Czech Republic, but we shall focus on the first three styles. All firepolished and table cut beads first start as a pressed bead, and all Czech beads first begin with one or several of the different colors of glass rods featured above and below. These glass rods are each about 3 inches in diameter and about 3 feet long. They come in dozens of different color varieties, and can also be mixed together in the kilns to create new colors. In all, hundreds of different color varieties are available. Fortunately for us, most factories use the same item numbers to track colors and shapes. The color card below lists many of the colors that are available for shape 151-99054. This shape’s colors are listed on the sheet. For example color 60060 (towards the bottom) is typically called “sapphire.’ Color 60070 would be slightly darker, and color 60050 would be slightly lighter. The item above that (60010/28701) is a lighter blue with the 28701 finish. The items above that have the AB finish (#27001). As this glass rod is into the pressing machine (below), the kiln portion turns the hard rod into molton glass. In this method, several colors can also be mixed together. As the glass becomes liquid it is dripped down in a molton stream where it is pressed or stamped by two identical molds into the desired shape. The photo below shows the pressing occuring, then cooling after being pressed. The picture below shows the pressing process up close. The room where the pressing what taking place was fairly dark, and the photograph is a bit blury, but you can make out the molton stream coming from the top, then being pressed by the mold in the center, and beginning to cool at the bottom. The image below shows one half of one of the molds, which presses four round beads and their holes as in one stamping motion as the two molds come together. As the glass continues down the shoot and cools, it is then broken into more manageable pieces and fed into a bucket. What this pressing process has created can be seen below. The shape has been pressed into the glass (round beads in this case), and will be tumbled to break off the outer portions and separate the desired bead shape from the scraps. The shape below is often called a ‘dagger’ or ‘drop’. Like the rounds, the desired shape will be separated from the scraps through the tumbling process. In this case, these beads had a mix of red and black rods to creat the color you see, and the mix means that each bead is unique. 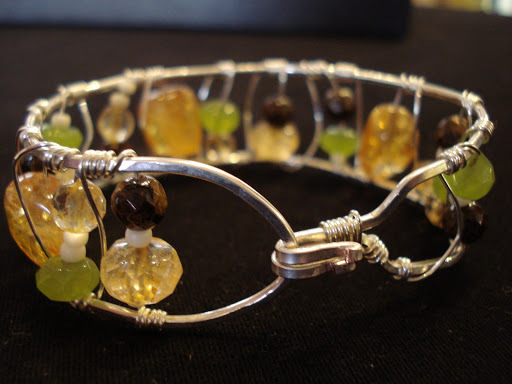 Here is another example of round beads once they have been separated from the scraps. These beads had several different colored rods combined to create the mix you see here. At this point, all beads go through the tumbling process to remove the scraps. The remains of the scraps can be reused again and again, and fed back into the kiln to melt into new beads (above). The tumbler is shown below. Tumbling involved a mix of water and sand (or other grit) to break apart and separate the scraps, as well as smooth the rough edges from the beads. At this point, the beads will be washed, sorted, dried, and packaged for distribution if the design is a pressed bead. If however the bead is meant to be faceted and firepolished, the beads are prepared for the next phase in the cutting and faceteing machines. To see how table cut beads are made, visit The Potomac Bead Company’s Table-Cut Bead Page. The tray (above) is loaded from a trough of pressed round beads (below). Generally each worker is working with several faceted trays at a time. As the worker is loading a new tray with beads, the faceting machine (below on the right) is cutting all of the beads down to the programed size using a series of spinning wheels with a rough finish (like sandpaper). Water is also applied to the wheels, both to make them last longer and to cut down on the dust. When the faceting phase is finished, the beads from the tray are dumped into this trough, and the empty tray is filled again with new round beads as the process repeats itself. Once the beads are faceted, they washed, then hand strung onto small metal rods as seen above to dry and prepare for firepolishing. Prior to the firepolishing, the facets are very sharp and pronounced, however, the beads have a slightly matted look. Now the trays of faceted beads are placed onto a conveyer belt, which will carry the trays through a large kiln (about 20 feet long). The beads take about 5 minutes to travel through the kiln, the temperature of which is about 1000 degrees farenheit. Above, at the opposite end of the kiln, the a gloved worker removes the rods of beads from the trays, and places them in a bucket to cool. Once cooled, the beads are removed from the rods, washed, and either packaged or hand-strung according to the customer’s instructions. The fire-polishing process has given the beads a bright, glossy, shiny finish that beaders love. There are litterally thousands of color and finish options for any shape and style of Czech beads. In addition to the endless color options, most factories can produce hundreds of different shapes, from pressed, to fire-polished, to table-cut. Some favorites include rounds, faceted rounds, faceted ovals, pressed leaves, daggers, nuggets, faceted rondelles, flowers, cubes, discs, squares, diamonds, and more. I always enjoy seeing products, but there is one bead in particular that I am particularly excited to see arrive in the store this summer. 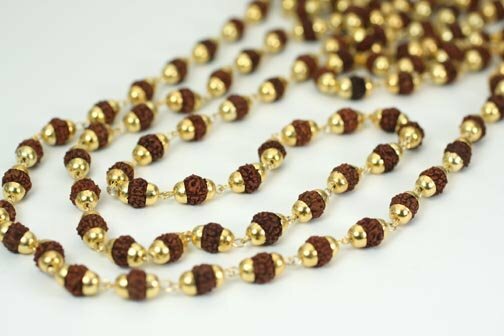 I hope that by giving you all a brief introduction to Rudraksha beads, you’ll anticipate their arrival as much as I do! I love beautiful beads, but what I love even more are beads that are both beautiful and cultural. A couple of years ago I found an example of a Hindu rosary with Rudraksha beads at the Smithsonian Institution in Washington, D.C. As a student of art and religion at the time, I began researching the history of the Rudraksha. The Rudraksha bead is a natural seed from the Rudraksha tree that grows in Nepal. Hindu monks have worn these beads for centuries and put faith in the bead’s mystical powers. While some claims in favor of the beads’ powers are hard to swallow, the medical community is still on the fence when it comes to their healing properties. For the non-Hindu (like myself) a fascination with Rudraksha is born out of a curiosity and respect for other cultures. Although it is just a bead, for me it was a catalyst towards learning more about the Hindu religion and developing a greater understanding of Eastern cultures. So, for a little bead, it can have quite an impact! Someone interested in buying these beads should become familiar with the mukhi system of measuring in the bead’s properties. The Rudraksha is a very wrinkly seed, similar to a peach pit, with many sections, like slices of an orange, called mukhi. Generally, the greater the number of mukhi, the more valuable the bead. One can find various charts that outline the specific properties of each mukhi. 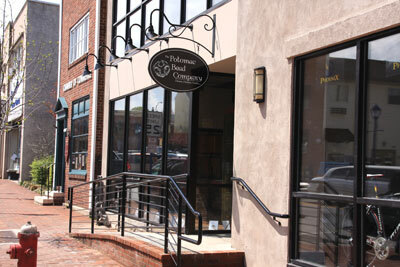 The newest Potomac Bead Company location opened last Tuesday in the heart of downtown Phoenixville, PA. Having opened all of our stores in downtown locations has given me a new love for architecture and the revitalization of the amazing old buildings that are hidden, just waiting to be brought back to life. I truly believe that our stores are prefect to highlight these turn of the century buildings that we have been so fortunate to find. Because our products are fairly small, we are able to leave the walls exposed with very little display or furniture. This allows the natural beauty of the architecture to be exposed and open for all to see. The exposed steel beams and rustic 1920’s look of this space and the old town Alexandria location make you forget that you are in the 21st century. 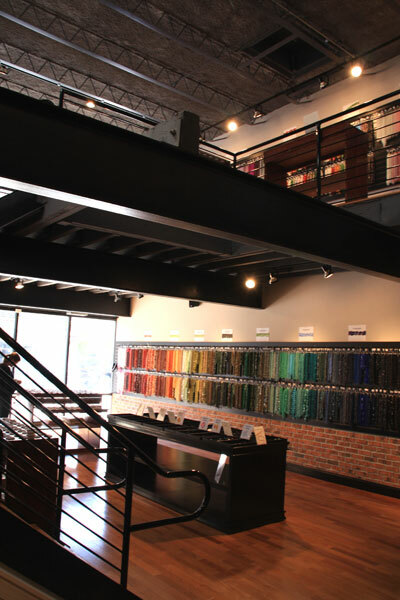 With all of the modern displays, colors, and technology available, it is nice to look at our retail spaces and not feel overwhelmed by the use of the space. 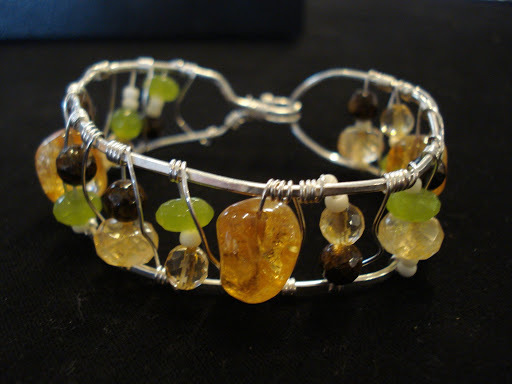 In my opinion, the industrial spaces actually add to the creativity and the Potomac Bead Company experience. When I walk into the downtown spaces, I marvel at the amount of work that went into making these magnificent buildings despite the lack of modern technology. There is such a vast amount of history behind these amazing architectural wonders. It is truly inspiring to think that the materials used in jewelry making are some of the same keeping our turn of the century buildings from crumbling. 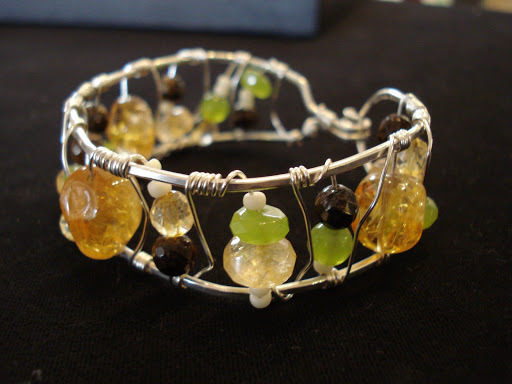 These materials act as wonderful mediums to inspire and create jewelry as well as other works of art. Overall, I have learned through this whole amazing experience of opening stores in wonderful old industrial cities, to take advantage of the architecture and detail of the buildings. So many buildings are over looked or discarded in people’s minds because they are not modern marvels or of certain materials. This point connects me back to jewelry and beads. It is often possible to over look the materials we already have and want to trade them in for something new. Be inspired by the history of the materials. They often just need a little help, like our buildings, to make them shine. Often, the simplest pieces are the most appealing and beautiful once they are reconfigured and re-worked. I am inspired to unpack the old beads and materials that I have accumulated over the years and bring them back to their glory. A final thought to finish this out: In an essence, we are housing the art of beads as well as finished jewelry inside what is already a work of art. 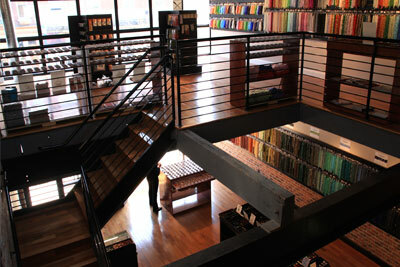 If you visit one of our stores, allow the architecture and the environment inspire you to create. As I ‘ve said before, we love going through new bead shipments… at least for the first day. After the 2nd, 3rd, or 4th days, unpacking can become tedious, but odly exciting at the same time. Often as Allie and I are unpacking and photographing new shipments, Allie will suddently grab a strand of beads, run over to her bead board, grab some wire, leather, or silver spacers, and start creating. “I have an idea and don’t want to forget it” she will say. Of course, as Allie and others are unpacking, checking off against the order sheet, and distributing for shipments to each of our stores, I am often photographing each new item as it comes out of the box. Some months this means thousands of new pictures, each of which must be edited, saved, filed, and resized for various future uses (signage, order sheets, website, etc.). Although my focus has always been business, I’ve always enjoyed and dabbled in photography. Having spent quite a bit of time around a darkroom when I was younger, I must say that the advances in digital photography are both amazing an useful! Over the years, we have photographed nearly every one of the 50,000+ items that have been sold in our stores. Obviously, this has forced me to become quite efficient at doing so, even if we have several thousand photos waiting for editing at any given time. Because many of our customers have jewelry design businesses of their own, we are often asked “how can I make my jewelry photos better”? To answer that, we created the Potomac Bead Company Photography Tutorial to help anyone with an interest in photographing jewelry, beads, or other small detailed items in an affordable and efficient way. While this is by no means the only way of taking photographs, perhaps you will find it useful! My workday usually consists of serving customers, making class schedules, managing employees, keeping the store clean, labeling products, and teaching classes. Every day an awed customer says to me, “You’re so lucky to sit around and make jewelry all day!” and I laugh inside because it seems that’s always the last thing on my mind! Although it is part of my job to create jewelry, I’m too distracted by the more urgent tasks. But today I took some time to stretch my creative muscle, and boy was it tight! I truly love to create interesting and beautiful pieces with the products we carry, but I don’t dedicate enough time to it. So I am resolving to spend more time diving into new ideas for ways to use the products in our stores…and to just have fun! I know this will help to keep me interested in my customers’ projects and personally knowledgeable about what to do with the products we supply. I’m so thankful to have a work environment that is so creativity-friendly!